Given the surprising number of negative reviews, I was worried when the curtains widened and the stylized Warner Bros logo appeared at the beginning of Man of Steel. The review aggregation site rottentomatoes.com had pegged the latest reboot of the Superman legend at a tepid 57%. But then, this was the same collection of critics who rated the execrable Star Trek: Into Darkness at an unfathomably favorable 87%. So I tried to be optimistic. I find myself agreeing with the guy on the AMC Movie Talk YouTube channel who said, "My only explanation for why some critics didn't like the show... is perhaps their heads were so far up their asses that they couldn't see the movie screen." 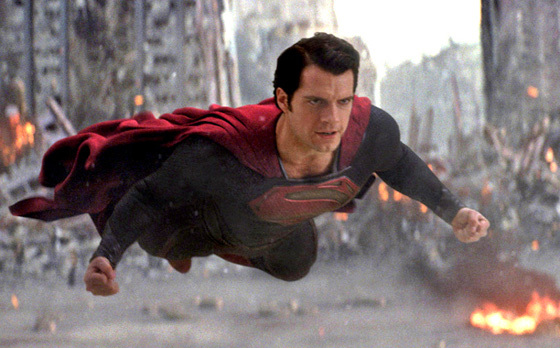 Man of Steel is unlike previous incarnations of Superman. It isn't presented like a fairy tale. It's a solid science fiction epic, but one that requires far less suspension of disbelief than other entries in the relatively new cgi-based superhero genre. This isn't the childish Superman who spins the world backward to reverse time, or gives Lois Lane amnesia by kissing her. The villain isn't trying to destroy California in order to make a killing in real estate, or forcing all the oil tankers in the world cruise in circles to jack up the price of gasoline. This is the story of an extraterrestrial refugee with amazing abilities, raised by good people after he was stranded as an infant on an alien world. He has to decide whether to defend his adopted planet or watch its destruction at the hands of members of his own true race. The criticisms I've read are disheartening. They mean some truly don't get the concept of Superman. They aren't bright enough to follow a straightforward narrative told partly in flashback to provide exposition and character motivation. They can't put aside the archaic "rules" that governed Superman's behavior, motivated not by a dedication to a higher moral code, but by the fear that government intervention would negatively affect comic book sales in the 1940s and 1950s. My first memory of television is watching George Reeves pause at a storeroom door, remove his glasses, then hurl himself via a barely-concealed springboard into the monochromatic skies of a stock footage Los Angeles. That was probably around 1958. It took them 55 years, but they finally got it right.